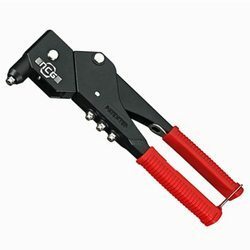 We are a leading Manufacturer of industrial hand riveting tools from Ahmedabad, India. We are the eminent provider of Industrial Hand Riveting Tools The product has great power to pull the material together as been made by the most suitable technical equipment. The rivet will strengthen the material and provide a firm association with the substance to provide no disturbance and gap. The installation is also very trouble-free as the company has consumer friendly production approach.